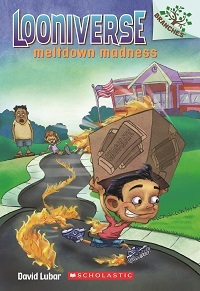 Meltdown Madness is the second book in the early chapter-book series, Looniverse. As Ed starts to learn to control his strange new powers, he does a terrible thing to the chocolate bars he's supposed to sell for the soccer team. Now, he and his friends have to figure out how to get of a big, gooey mess.